As a pastor, I officiate plenty of weddings. From my pastoral vantage point, I get the best view of the ceremony. For example, I am able to see the bride as she first appears and begins to walk down the aisle. I see her in all of her bridal glory as she gazes into the eyes of the groom while he waits anxiously at the front of the church (or wedding venue, as is so often the case these days). 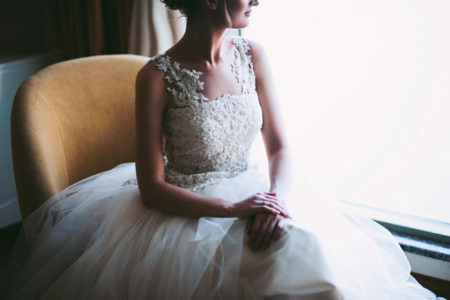 In her stunning dress and with her emotions surging, a bride almost seems to glow with a supernatural light. A similar vision of a human bride seems to be in the mind of John as he describes what he sees in Revelation 21:9 and following. An angel carries him to a high mountain in order to show him “the bride, the wife of the Lamb” (21:9). The Lamb, in this context, is Jesus. From the mountaintop, John sees “the Holy City, Jerusalem, coming down out of heaven from God” (21:10). Now this seems like a peculiar mixed metaphor, doesn’t it? If, at your next wedding, you told the mother of the bride, “Your daughter looks just like a city,” the mother would be confused if not a little bugged. We wonder why John describes the bride of Christ with an urban metaphor. The explanation comes in verse 11. The Holy City, coming down from heaven, “shone with the glory of God, and its brilliance was like that of a very precious jewel, like a jasper, clear as crystal.” The city of God was glowing in the way a bride glows at her wedding. Notice that this city is not just the lodging for God’s people but also a representation of God’s people. We are the radiant bride, the city coming from heaven in stunning glory. The bridal and marriage imagery highlights not only the brilliance of the people of God, but also our intimate relationship with Christ, who is the Lamb. We are not just people he saved from sin. We are not just his servants. But we, as the people of God together, are the beloved bride, the cherished wife of Christ. As a wife with her husband, we are deeply unified with and intimately joined to Christ. We are in covenant relationship with him forever. Have you ever seen anything that reminds you of the radiance of the Holy City in this vision? How do you respond to the imagery in Revelation 21:9-11? Gracious God, thank you for allowing us to see through John’s eyes, so that we might glimpse the glorious future you have for us. What an incredible honor to be the bride of the Lamb, the bride of Christ. Thank you, Lord, for loving us and valuing us this much. As we look forward to all that lies ahead for us, may we live each day—including today—with the joy of knowing that we belong to you forever, and that you love us with a love that will never let us go. Amen. This post was originally published on April 25, 2016.